Benedict, your work has sometimes divided audiences in the past. Do you think Australian audiences are becoming more adventurous? BA: I think it's great if people have mixed feelings about work because it means the work is alive. I don't think theatre should always be easy to consume. It should be a difficult and delicious pleasure. It's an insult to the audience to think you should pander to them or make it easy. We go to the theatre to get closer to people. I don't mean that in a touchy-feely way … We go to the theatre to understand people more, to get deeper into them and to be touched by them. Whether my work has been divisive or not, it should be judged on whether it does that. Did a theatrical event take place? Did it touch you? Did it make you laugh or cry? Did you get closer to someone? That's all I care about. 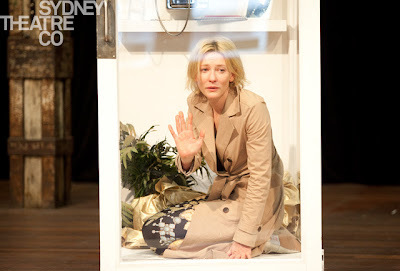 Benedict, do you remember the first production you saw Cate perform in? BA: As a young theatre maker, I was struck by her access to her emotions and her ability to involve us in her thoughts. I think that's what great acting is: to let us know every single thing that person is thinking. That's very simple and f---ing difficult, and when it happens it's magic: to be involved in the thoughts of another human being. We should be in awe of actors. They show us naked life. We're too busy with our own lives to see ourselves. Cate, what do you look for in a theatre director? CB: Richard Roxburgh and Hugo [Weaving] and I were saying when we were doing Uncle Vanya that once you've played a certain number of roles on stage, you can get mollycoddled a little bit. Directors just leave you alone to do that little wonderful thing you do, which is basically your bag of tricks, your habits. So it's really great to have big things and new things demanded of you. Tamas [Ascher, director of Uncle Vanya] did that and Beno does that. I think that's what happens with actor training. You come out thinking the director is going to tell you what to do. That's a cliche. It is not the director's job to connect the dots for you. The director makes a proposition and you complete the sentence - that's the actor's job. The photo is from rehearsal photos from Gross Und Klein courtesy of STC Blog. For more photos, please click here. Are your kids interested in acting and performing? They had a ball on the set of The Hobbit. They love the process of it. They’ve been backstage a lot. I think it’s great for them, because they actually see an actor being just a regular person, and then they see them drop into a role and walk on stage and come off. It sort of demystifies it in a way. We’re doing this education programme at work, and we were in a primary school just observing a drama class the other day, and you can see all the little girls thinking, “I’ve seen you in a movie.” And there was this girl who had drawn frocks and she made a little doll of me, so sweet, but I think they get enamoured with that sort of side. And the one thing about my kids – and maybe they’ll choose not to be actors because of it – [is that] they can see the work that goes into it. They can see it’s a very practical job in a lot of ways. There’s a lot of practical decision-making that goes into it, and I think that’s a wonderful thing for them, spending time in the theatre. They can see the construction of the sets. They can see what the stage manager does. They can see what the director does, and they can see that the actors are one part of that. They’re not princes and princesses.